In this self paced tutorial you will learn how to build, deploy, and expose container based APIs using JBoss Fuse Integration Services (FIS) 2.0 for OpenShift. This introductory service will expose the People Service API which includes methods for adding, searching, and listing individuals. 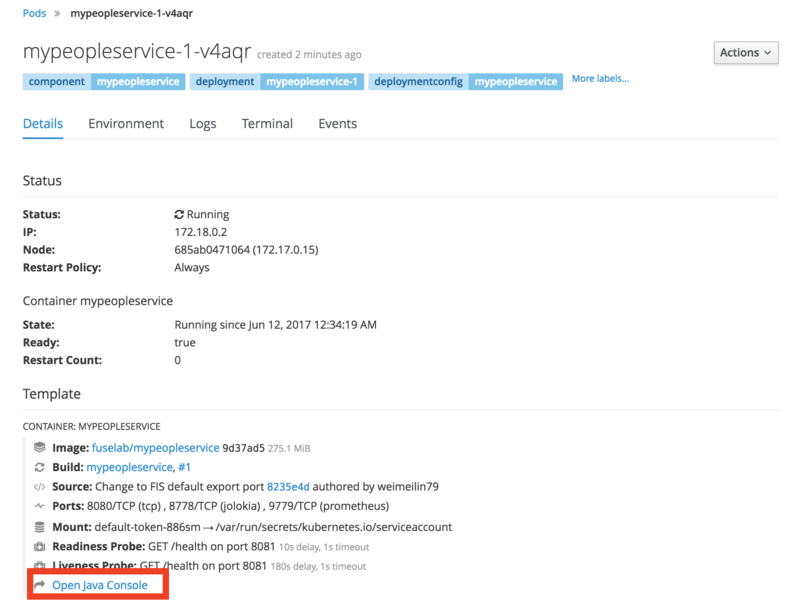 In addition, the People Service API will publish the associated API Swagger documentation via FIS Camel SWAGGER. If you are not familiar with the OpenShift Container Platform, it&apos;s worth taking a few minutes to understand the basics of the platform as well as the environment that you will be using for this self paced tutorial. Head on over to Learning OpenShift - Getting Started. Red Hat JBoss FIS 2.0 is an agile, lightweight, and modern development framework for building and deploying highly scalable and modular APIs. A true hybrid solution, JBoss FIS 2.0 offers best of container based development practices coupled with well known microservices and enterprise integration patterns including: Proxy/Sidecars, Circuit Breakers, Tracing, Routing, Transformations, Auditing and more. 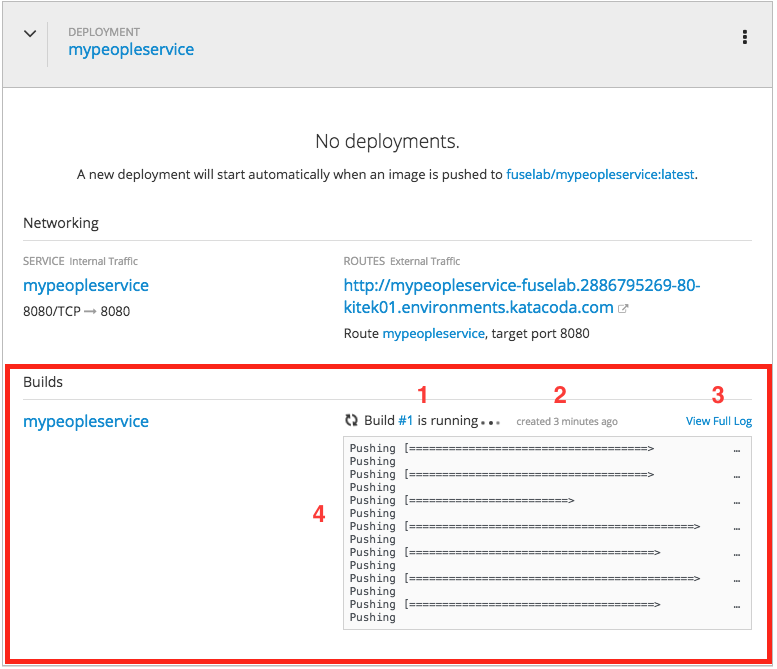 Deploy Fuse application from an existing Docker-formatted image. 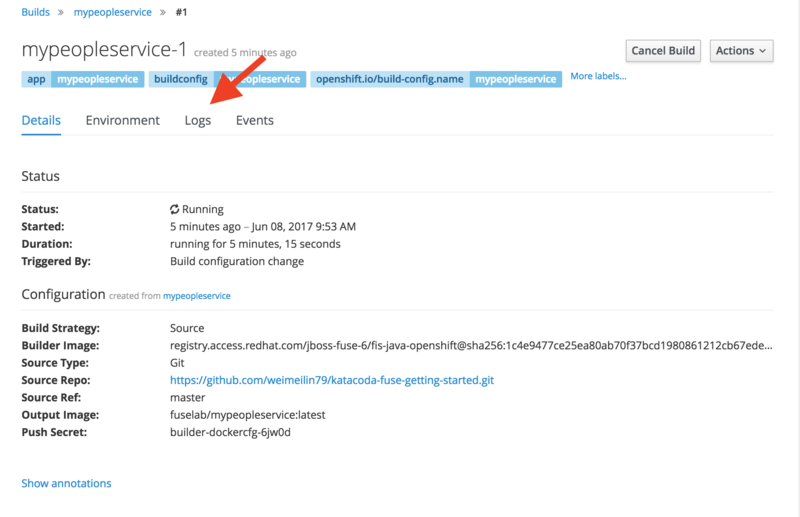 Build Fuse locally and push the build result into OpenShift, a Binary Source-to-Image (s2i) builder. Build and deploy from source code contained in a Git repository using a Source-to-Image builder. For our introductory lesson we are going to use OpenShifts s2i repository builder to pull in, build and deploy a JBoss FIS API service using the SpringBoot container runtime. So lets get started! Congratulations! You just finished learning how to deploy your own JBoss Fuse Integration Service to OpenShift. Pretty simple isn&apos;t it? Now you are probably interested in expanding your work with OpenShift in a less structured environment. You can start with setting up your own OpenShift environment if you haven&apos;t already or if you have maybe expanding on what you have learned to build your own JBoss FIS 2.0 applications. For hints and ideas of where to start next check out the resources below. For additional details or deeper dives please see the list of links and references below. Minishift Minishift is a complete OpenShift environment that you can run on your local machine. Now switch to the Dashboard and login to the OpenShift web console using the same credentials you used above. Click on fuselab to be taken to the project Overview page for fuselab. As the project is currently empty, you should be presented with an Add to Project button. Click Continue on to see how to add the first application to this project. Its now time to build and deploy the People Service API onto OpenShift. To do this we will be using OpenShift&apos;s Source 2 Image capabilities, also referred to as S2I . 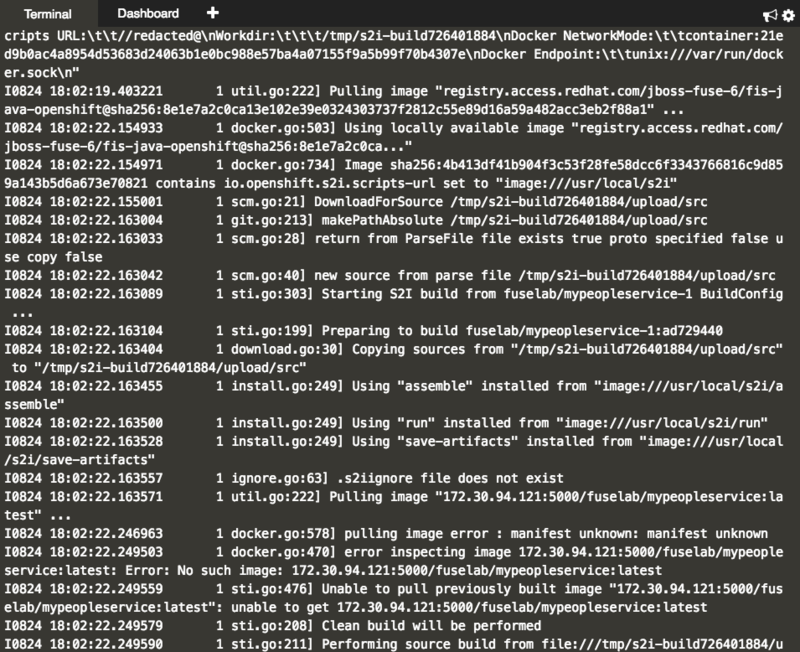 The OpenShift S2I tool injects application source code into a container image and the final product is a new and ready-to-run container image that incorporates the builder image and built source code. You can find more details regarding S2I at the finish of this scenario. To get started with S2I, we will use a pre-defined template for our People Service API which contains the details for the APIs build, deployment, and services configurations. The template also references the source repositories which contain the Fuse API application. For reference the template is located here. Use &apos;oc start-build mypeopleservice&apos; to start a build. The oc new-app command creates a new application in OpenShift either by using a local or remote project. In this case we have used a project hosted remotely at GitHub, the location of which can be found at the bottom of the referenced template. Now that the applications template is configured in our project we can start the build and deployment part of this scenario. Which is followed by build "mypeopleservice-1" started if the the command is completed successfully. How do we know if the build is actually working or not. Well there are a couple of ways we can monitor the build of our application. Click Continue on to see how. Now that we have kicked off our People Service API build and deployment lets take a look at the logs from our build. First we can take a look at the output from the command line. What you will see is the streaming output of our build which, for the most part, will look like a typical Maven build running through its lifecycle. As part of the oc logs -f bc/mypeopleservice command we also are passing in the -f flag. This is the follow log flag which streams the output till complete or till you hit ctrl-c. This output can also be seen in the OpenShift Web Console. Now open the OpenShift Web console by selecting the Dashboard tab at the top of your screen and then click the Overview menu on the left. Here you can view the details of the application created and monitor progress as it is built and deployed. This page will refresh periodically as events in the system, such as your build, begin to occur. Note: Generally, first time builds will take an additional few minutes to complete as Maven initializes the application&apos;s local repository. At a quick glance, the build summary is more than helpful but what if we need to take a deeper look at the build output logs? Well, you have a couple ways available to view the full logs output in progress, the first of which is clicking on View Full Log (#3 above). This will bring you to the Logs tab of the Pod for the build which is running. 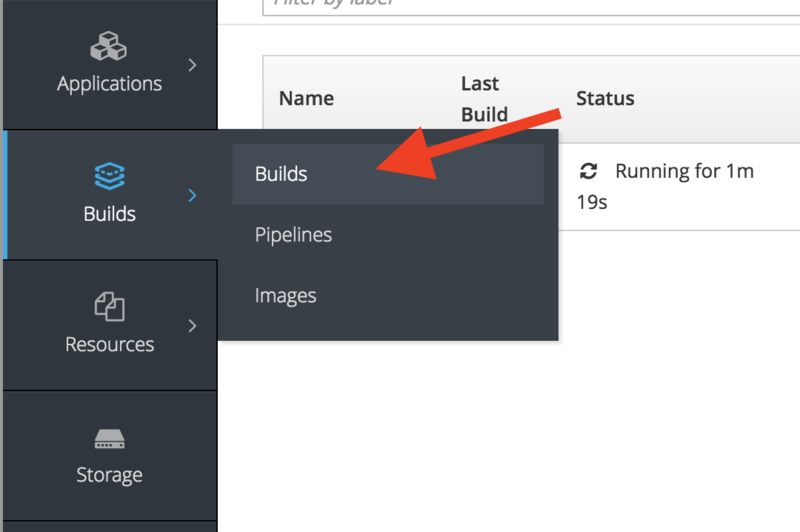 If you are in a screen other than the Overview screen, the build logs are accessible by selecting the Builds menu and then selecting the running build, #1 under the Last Build column. This will bring up a list of builds which are currently running, as well as builds which have completed. Select on the build number of the last build to bring up the details for the build. Select on the Logs tab to bring up the log output for the build. Once the build of the application image has completed, it will be deployed. The Overview page will indicate this by the banner listing the status of the build as complete. The Deployment Config pane will also show the state of the deployment and indicate the number of running pods. Now that we have successfully built our application, click Continue to take it for a test drive on the JBoss Fuse Hawtio Console. In this next section of the scenario we will use the JBoss FIS 2.0 Hawtio Console to test and review the behavior of our new route. 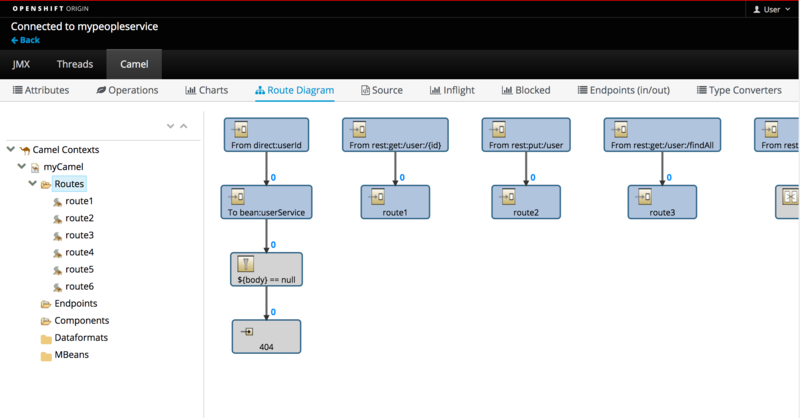 The JBoss Fuse Hawtio console provides in depth details into the Camel and ActiveMQ components deployed as part of a JBoss FIS 2.0 application. This includes standard JVM resources such as memory and threads as well as JMX attributes and operations. The Hawtio console also provides a full selection of tools used to drill into the JBoss FIS 2.0 Camel and ActiveMQ components. To get there we start with selecting the Applications menu on the left and then select Pods. You will be taken directly to the pod detail page. Below the Template section on the page you will find a link named "Open Java Console". Go ahead and click it. You are now taken to the JBoss Fuse Hawtio console. 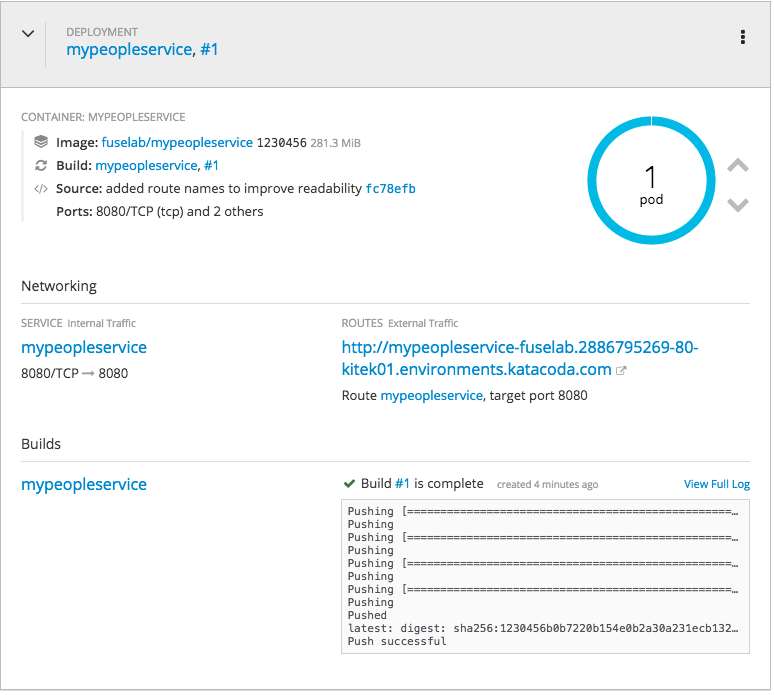 Continue on to see how we can get better insight into the People Service API through this console deployed with all JBoss FIS 2.0 applications. Now lets take a look at calling the APIs and tracing that output on the Hawtio console. The terminal is nice and all but what about seeing more details in the Hawtio console. Do you remember how to get there? Lets continue on over to the last step of the scenario and take a look at the API docs which our route provides by clicking the Continue button. When building an API for other services to consume its important to document the API as well as provide the schema for its use. For our API we used the Camel Swagger Java component to generate our API document. Swagger is the world’s largest framework of API developer tools for the OpenAPI Specification(OAS), enabling development across the entire API lifecycle, from design and documentation, to test and deployment. "name" : "The Apache Camel team"
"description" : "User rest service"
"description" : "Echo rest service"
"description" : "User not found"
"description" : "The id of the user"
"description" : "The name of the user"
And there you have it. 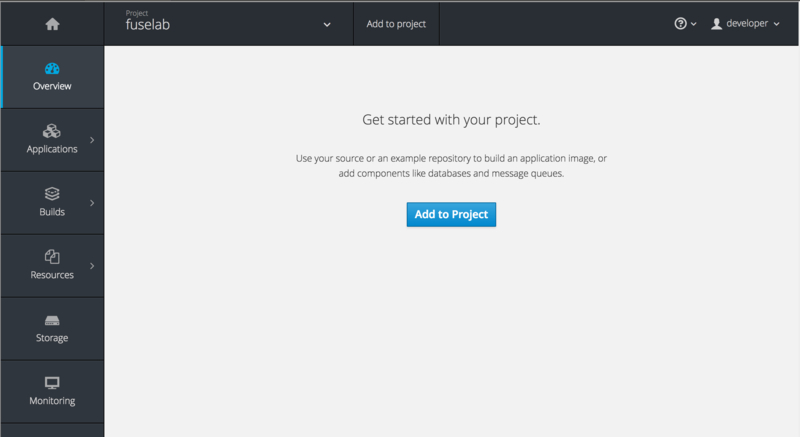 In just 15 minutes you have spun up a project on OpenShift and rolled out your new API. Pretty simple isn&apos;t it. Stay tuned as we expand our JBoss Fuse API tutorial by demonstrating how to customize your JBoss Fuse API service. Cheers!! !